For almost 70 years, the romantic drama Casablanca has endured as an audience favorite. Further proof of that appeal came on June 29-30, 2012 at the Redford Theatre. More than 1,500 patrons escaped from the blistering heat of summer to watch the three showings of this gallant tale of resistance to Nazi tyranny during World War II. Its patriotic tone helped kick off a week of celebrations of the Independence Day holiday in the United States. To help promote this web site, and entertain visitors, I set up a historical display in the Redford front lobby about the initial release of Casablanca in 1942 (New York City) and 1943 (Detroit and Ann Arbor). It included newspaper ads from each of those cities. 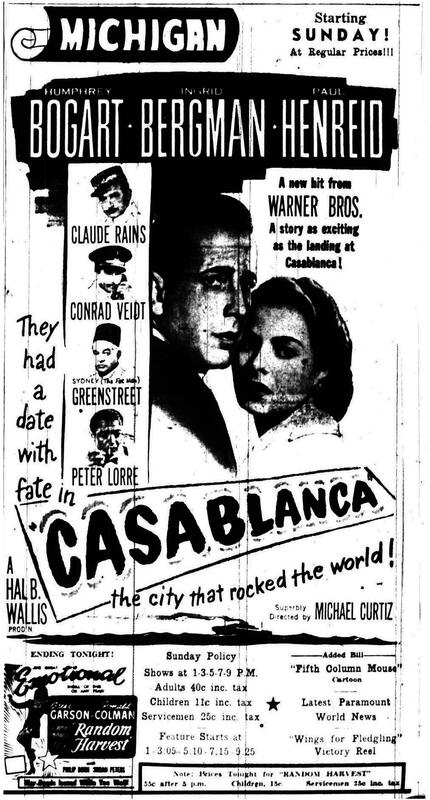 It also included full newspaper pages from the day that Casablanca opened at the old Michigan Theater in Detroit (April 9, 1943). I wanted to help transport visitors back to the time when Casablanca was a brand new movie, and its wartime setting was a daily reality for everyone living at that time. 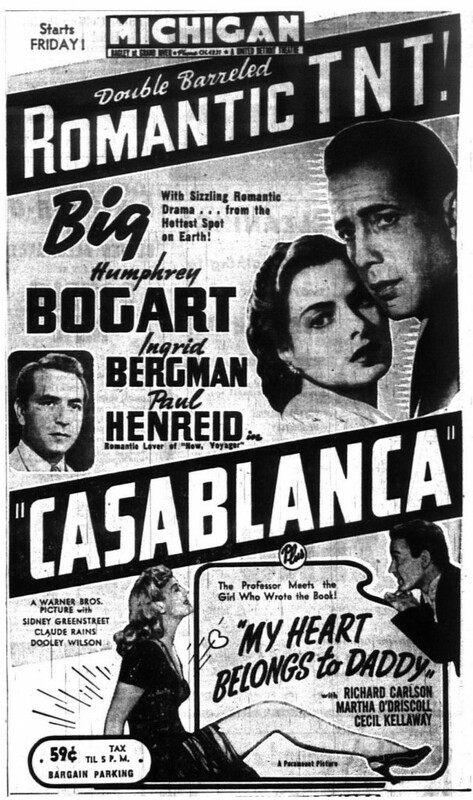 Stage announcer Greg Sumner, a history professor at the University of Detroit Mercy, added to this message by telling the audience that when Casablanca was released, the outcome of World War II was still very much in doubt. The morale-boosting value of the movie was probably strongest during the café scene when resistance fighter Paul Henreid led the café band in a rousing version of the French national anthem “La Marseillaise,” to drown out loud singing by some German military officers. This scene might have helped Redford patrons better appreciate the significance of Independence Day, which commemorates the United States breaking free from the authority of England. Greg’s remarks and my display helped add a personal touch to another night at the movies for Redford visitors. But many of the patrons had their own personal feelings about the film. A woman who picked up copies of Casablanca publicity from my display table excitedly told me that this was her parents’ favorite movie, and that she had brought them to the Redford that evening. An man with a very emotional tone in his voice shook my hand and told me that this was his favorite film, and he had first seen it when he was 12 years old. He added that he had brought along his 12 year old grandson to see it at the Redford. A woman told me that she always sees something new in Casablanca. She remarked that people were more romantic back then, in the way that they looked at each other and touched each other. My display included a big newspaper listing of Detroit area movie theaters from April 9, 1943. I found it remarkable how many memories and social observations were provoked by the ads. One man went through the whole list and estimated that only about 10 or so theaters remained. People looked for the theaters that were near where they had grown up. The reactions to the theater ads reminded me that the Redford helps connect people to a time when there were many movie theaters in the city of Detroit. Perhaps that listing of theaters gave visitors new insights into the changes that have occurred both in their lives and in Detroit. Area movie fans will soon have another chance to celebrate the 70th anniversary of Casablanca, in another theater where it originally appeared. This entry was posted in Holidays, Independence Day, Redford Theatre. Bookmark the permalink.